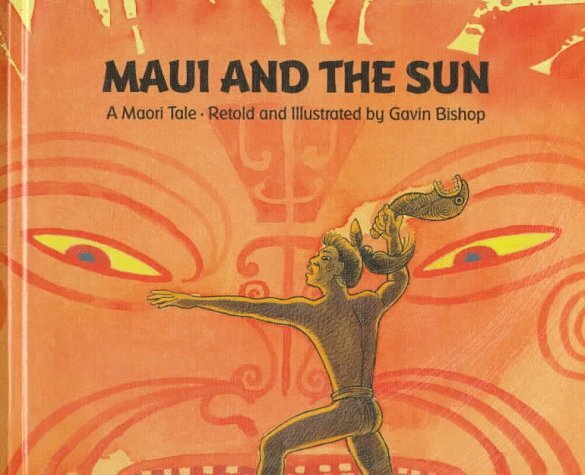 This is a Polynesian tale of a trickster called Maui, and how he tamed the fiery sun into going more slowly across the sky, so the days could be longer. According to the Maoris of New Zealand, Maui was considered to be a demigod; a genius, a delinquent, a trickster and a hero. There are several variations of this story, but this version is based on a story told in the 1840s. Maui and his brothers were out fishing one day, when they realized they couldn't be home before dark to cook their fish. The brothers bemoan how the sun races across the sky to get to his bed, and the days are so short, as a result. Maui wants to catch the lazy old sun and teach him a lesson. Only the brothers declare that it is impossible. Maui, the ever resourceful one, says that it can be done. By the time they reach the village, it is dark and as they cook and eat their fish in the dark, they relent and think that perhaps capturing the sun and teaching him a lesson is not such a foolish idea after all. Maui convinces the whole village, who all engage in the task of aiding him and his brothers in their mission. For days, everyone works in the swamp, cutting flax until one day, there is enough according to Maui. With it, they make ropes of all kinds. Thick rope, square, flat rope and twisted round ones. When they have finished, they tie it into bundles and set off towards the east, in the dark of the night, so as not to be seen by the sun. Maui also takes along with him his enchanted weapon, the magic jawbone of his grandfather. After many days and weeks of travelling in this manner, they reach the east, at the edge of a pit where the sun sleeps. The manner in which they try to trap the sun, and the methods employed by him to get the job done, are what forms the crux of the rest of the story. They build clay walls on the edge of the pit, to hide behind and wait with their nets, for the sun to rise. And as He does, they cast their nets over him, slowing down his ascent, whilst Maui strikes some severe blows on the sun, with his magic jawbone. Entrapped and beleaguered by the fierce blows, the sun tires and cries out for mercy, revealing his secret name in the process....Tama nui te Ra, meaning 'Great Son of the day'. Hearing this secret name gives Maui the much needed power over the Sun. And as a result, it starts moving more slowly across the sky, from then on. But the almighty Sun is not one to take things lying down very easily. In revenge, He starts going even more slowly across the sky, making the days very long and very hot. Soon, the lands become parched and dry, people are unable to sleep because of the constant light and the Sun burns Maui's hand, as he tends to his garden one day. What ensues is another big tussle between Maui and the Sun, where Maui catches hold of the sun once more, and this time hooks him to the moon. Such that when the sun sets the next time, He pulls the moon out from under the sea. And from then on, Maui has light both night and day. This retelling is a much simpler version of the older folk-tale which has a lot more characters and complexities weaved in to the narrative. But as we read through the story, the constant mystifying question in our minds was : how would Maui ever manage to catch the great and mighty sun into doing his bidding? What tricks would he use to achieve his ends? And that slight undercurrent of a question....will I be convinced, as a reader, in the premise and the conclusion of this story? But that's just the thing about these folktales of lore. They open you up to the idea of fantasy and a world where anything is possible, and everything goes, with just a tiny stretch of the imagination. Aided by that, and the stunning, rich vivid illustrations of pen and ink and watercolor drawings by Gavin Bishop, we are intrigued by the fierce, tattooed sun, always shown too large to be depicted on a single page and struck by the strange , circular tattoos on Maui's face, showing symbolized details of his genealogy and social rank. Together, they draw us comfortably into a story, which has done the rounds for thousands of years, throughout the islands of Polynesia, and enable us to partake, just a bit, in that rich cultural heritage of the South Pacific! For a bit more sampling of this tale, help yourself to this simple animated strip, told in Te Reo Maori, with English Subtitles! Is this a first- a video on the ST page! Wow!! This too sounds a lovely book. You people are increasing the height of my TBR pile. Tharini, thanks for the follow. Beautifully written review Tharini. An amazing pick for crocus! The illustrations must have been somthing...seeing the video and Bishop's books on his website. Fantastic tale, beautifully told and illustrated from the looks of the video. Thanks for bringing it alive with your review! Our library doesn't carry it, unfortunately. I'm awed by the number of myths revolving around the sun. Rooster and the sun from Smriti's review last year is still a favorite here. WHat a lovely story - I think we will love it here. Will try looking for it. Love how you always bring the perspective of the adult reading alongside the child! Am loving the glut of folktales I am coming across over the last few days. Wonderful review, Tharini. The sounds and syntax of the language spoken on the video seemed very similar to the Bushman tongue one encountered in "The Gods must be crazy." Just a thought. T, wonderrific review as usual. It is not just opening mind to fantasy. Folk lore to me is lots of allegorical associations built over ages of story telling. Wonderful pick and thoroughly enjoyed your review Tharini ! It amazes me when I read such trickster tales, that stretch our fantasy while making it so convincing in the story! Retellings of folktales can be very delightful. I often look out for such books. The four year old is into The Little Red Hen, Three Little Pigs and such... I can't wait to introduce more meaty ones, particularly this polynesian take on a traditional story. Your review captures it all very beautifully. Thanks, T!